I'd like to give the former owners of my home the benefit of the doubt when it comes to a lot of things around the house. Perhaps there was a really good reason the kitchen doesn't have insulation in the walls and ceiling. Maybe different crews finished the basement at different times which could explain why the master light panel is behind the bar and requires one to walk through a dark basement to turn most of the lights on. In the almost two years we have lived here there are countless times Nightingale and I have asked: "WTF were they thinking!" 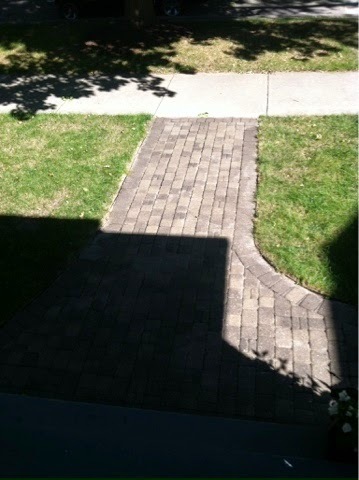 Our front walk, side driveway and backyard are comprised of paver stones. They are nicer than asphalt or concrete but do require some maintenance upkeep. I did my Google and YouTube research and found that paver stones require you periodically sweep in paver sand between the joints at least three times a year. This keeps them from moving and if they were installed properly (level) then you don't have too many puddles after a big rain. Unfortunately, the pavers used by Previous_Owner are not the kind of paver stones that look pretty when power washed like my neighbors. I have to wonder, was it cost, technology or both that went into the decision not to use the prettier ones. I can only assume that either they were not available when this project was done or they were hugely cost prohibitive. 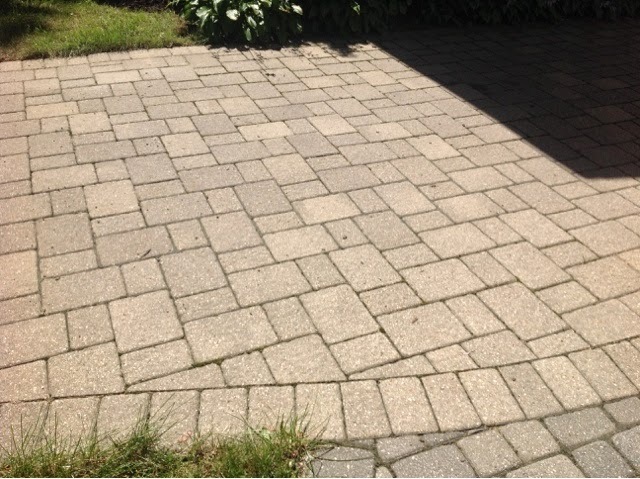 My research yielded a chemical enhancer/sealer that you can apply to paver stones to keep them looking good. 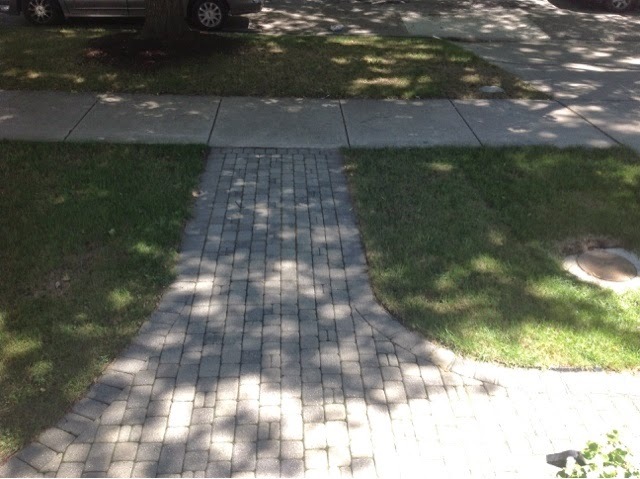 Unfortunately, again the enhancer doesn't do much to my type of paver and at $50 a half gallon, it is cost probative for me to do my entire backyard and driveway, so only the front walk got treatment. It might be hard to notice the difference in the pictures. I meant to take better before and after pictures but it was a very busy week when I did this project and I had a short window between good warm weather to dry the sealer and the upcoming storm. I got a deal on a power washing on Angie's List so I outsourced that part.